Nazaré lies only 80 miles north of Lisbon, but this small coastal town feels a world away from the bustling Portuguese capital. With a proud fishing tradition dating back many hundreds of years, spectacular waves, and picturesque orange-roofed buildings packed along a long, golden beach, it’s a beautiful, chilled-out place to spend a night or two. If you’re planning a trip to Nazaré, these are several of the best ways to spend your time. Nazaré’s crescent-shaped main beach (Praia da Nazaré) has been voted one of the best in the country, and the pristine golden sand attracts many Portuguese and international visitors in summer. Protected from the Atlantic winds by a 300+ foot high headland, the area directly in front of the old town is a calm, sheltered spot to sunbathe and relax. Colorful umbrellas pop up like mushrooms in late spring, but peak season is July and August. Expect crowds close to the headland at that time of year, but if you’re happy to brave the winds further down the beach, you’ll still be able to get a patch of sand to yourself. Once the European vacation season finishes in September, tourist numbers drop dramatically. If you visit on a sunny winter’s day, you may find the beach almost completely empty. Just be sure to pack some warm clothes, as once you’re away from the shelter of the cliffs, the wind can cut like a knife that time of year. Praia do Norte (North Beach) lies just on the other side of the headland but feels like it could be in a different country. Exposed to the prevailing weather, it’s a windswept stretch of sand best suited to bracing walks—any umbrellas or beach towels would likely end up blown out to sea in minutes! Nazaré’s biggest claim to fame in recent years is the size of its waves. The presence of the nearby Nazaré underwater canyon—the largest such canyon in Europe—creates huge breakers at certain times of the year. Particularly during stormy weather or king tides in winter, waves 100 feet high can form just offshore, attracting big-name surfers from all over the world. Back in 2011, Hawaiian surfer Garrett McNamara set a world record in Nazaré, successfully riding a giant 78-foot wave. Two years later, both he and Carlos Burle claimed to have conquered 100+ foot high monsters in the same place, but neither has been officially credited with the record. When conditions are perfect, Nazaré turns into a busy surf town for a few days—if you happen to be in Portugal at the right time, it’s worth keeping an eye on the surf report and planning a visit yourself. The best places to check out the action are from Praia do Norte, or on the edge of the headland near the lighthouse if you can find a spot! While it’s all officially one town, Nazaré is split into two distinct areas: The beach and main town, and O Sitio, atop the cliffs. It’s possible to walk from one to the other, either directly on steps up and down the cliff, or a longer, somewhat flatter route along the road. If you haven’t packed good walking shoes, or aren’t in the mood for a workout, there’s a more appealing option: The funicular. The short railway runs from top to bottom and vice versa every fifteen minutes and dates back to a steam-powered version from the late 19th century. Thankfully it’s been extensively modernized since then! The journey only takes a couple of minutes. You’ll get decent views from the carriage on the way up, but the best shots are from the top of the cliff once you arrive. There are more reasons to head up to O Sitio than just the pretty photos, however. It’s a somewhat quieter, less-busy spot than down on the beach in summer—you’ll find a better (and less expensive) range of shopping and dining options, and it’s also worth buying an espresso and checking out the well-preserved church in the main square. That square and nearby streets are also the ideal places to buy hand-crafted souvenirs. Many aren’t particularly expensive, and a definite step up from the mass-produced items you’re likely to find elsewhere in town. Long before it was a surfing mecca or a holiday hotspot, Nazaré was a productive fishing village. While tourism is the biggest contributor to the local economy these days, old traditions die hard, and the town is one of the best places in Portugal to get a taste of that bygone era. It only takes a walk along the beachfront to see your first example: The wives of local fishermen dressed in traditional multi-layered petticoats, hand-stitched aprons, and headscarves. While many now wear the complicated attire mainly to attract the attention of tourists and try to sell them overpriced accommodation, there are still a few who do so just because it’s what’s always been worn in this town. If you time your walk right, late on a Saturday afternoon in summer, you’ll coincide it with the return of the fishing boats, and the arte xávega (net dragging) spectacle. Nets bursting with fish are dragged up the beach by teams of fishermen, as their colorfully-dressed wives loudly call out what’s on offer. The rest of the time, the boats return to a purpose-built, albeit far less romantic, harbor a half-hour walk to the south. 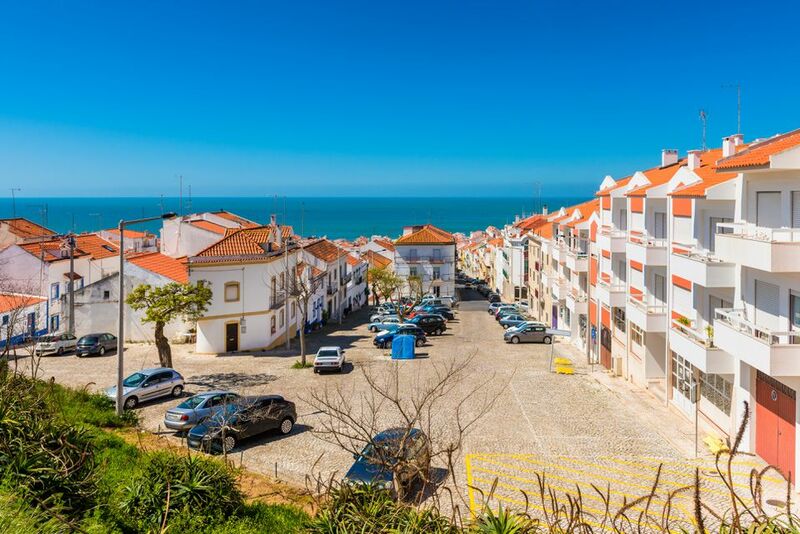 It’s not hard to find picturesque streets almost anywhere in Portugal, and Nazaré is no exception. While shiny new apartment blocks have sprung up here and there, traditional stone buildings and orange-roofed houses still dominate the view from the headland. Down at ground level, skinny cobbled lanes abound, and walking a few blocks back from the beach can feel like you’ve also traveled back in time by a century or two. This is where local life is lived, at a slower pace of life away from the busy waterfront restaurants and bars. There are no must-visit sites along these narrow streets, but the area is so photogenic that you’ll likely get the camera out just as often as you would at a major attraction. It’s worth putting your map and phone away, and just wandering without a particular destination in mind. Grab a coffee, small beer, or glass of vinho verde as the mood takes you—the town is too small to get properly lost, and even if you do get temporarily confused about where you are, it’s easy to find your way back to the beach. What’s the best part about staying in a fishing town? The seafood, of course! The waters of the Atlantic have been a major influence on Portuguese cuisine for many centuries, and there’s no better place to experience it than somewhere like Nazaré. If you’re visiting during summer, treat yourself to dinner and a couple of glasses of local wine at an outdoor table at one of the beachfront restaurants. Sure, you’ll pay a little more than a few blocks back from the water, but it’ll still be good value by international standards, with a view that’s hard to beat. Make a reservation for an hour before nightfall, and enjoy your meal bathed in the last rays of the setting sun. It's one you'll remember long after the waiter has cleared away the table. Specialties of the region include barnacles, freshly harvested from the dangerous rocks nearby, and polvo à lagareiro, a whole octopus oven-roasted in garlic and olive oil, but you can’t really go wrong with anything recently-plucked from the ocean in this part of the world. If you're in need of a snack during the day and feeling a little adventurous, seek out the salted fish left drying on nets in the sun. They've definitely got a memorable taste and texture!